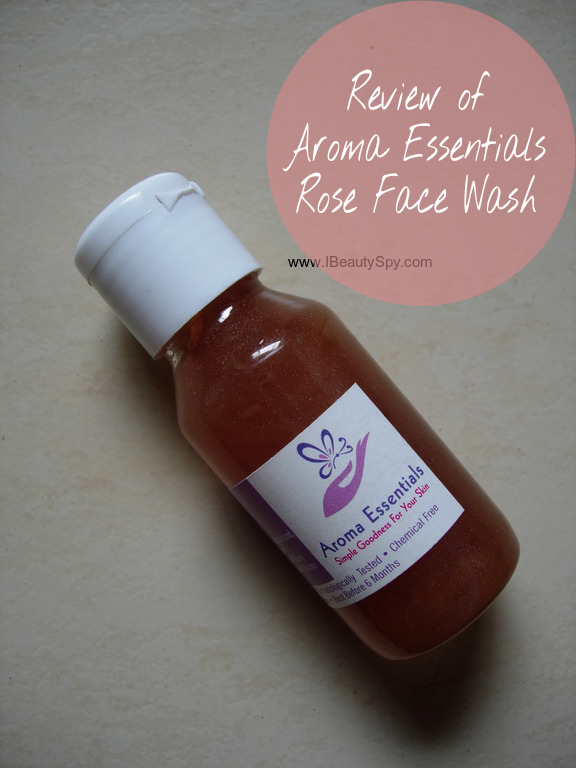 Today I will be reviewing my recent love – Aroma Essentials Rose Face Wash. There are numerous face washes out there in the market. But very few that actually makes you look forward to your face wash time everyday. This 100% natural and handmade Rose Face Wash from Aroma Essentials is a treat for your skin as well as affordable. Natural handmade skin and hair care products. All our products are freshly handmade in small batches using the finest natural ingredients. We do not use harsh chemicals like petroleum or mineral oil. The color and scent of our products occur naturally from our ingredients and essential oils. No artificial colors and scents are added. Store in a cool dry place away from sunlight. Healthy looking, supple skin. Gives moisturized, softened, smoothed and soothed skin. Rs.95 for 30ml, Rs.175 for 60 ml and Rs.350 for 120ml. First of all, let me say I love rose based beauty products. Not just for the pleasant and calming fragrance, but rose is highly beneficial for the skin. Using it regularly can give you baby soft and rosy skin. 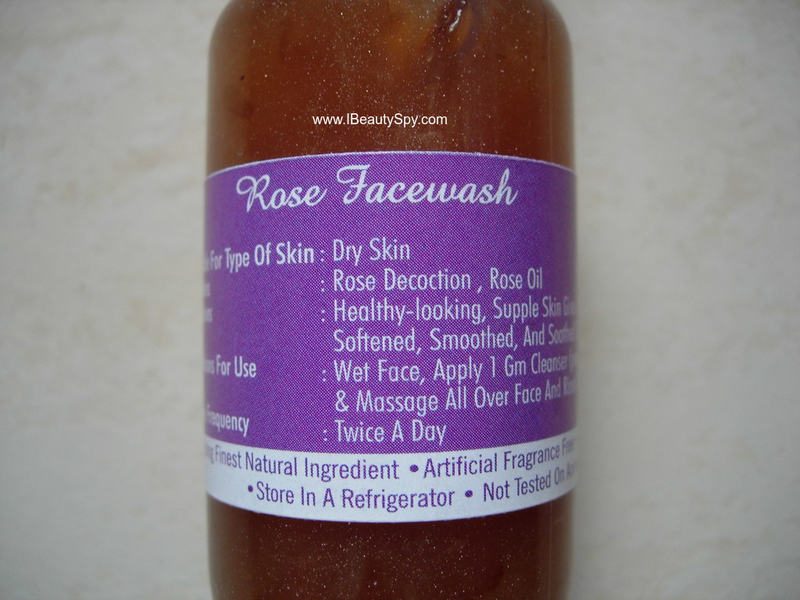 There are many rose based face washes available in the market. But nothing I have tried is close to this Aroma Essentials Rose Face Wash, mainly because the others are filled with artificial rose fragrances in the name of rose face washes. It comes in a small plastic bottle with a flip-open cap. Since its a handmade product, there is no fancy packaging. But it is compact and can easily fit in your handbag for travelling. The face wash is light pinkish brownish in color and has a thick gel-like consistency with some rose petals in it. Imagine blending rose petals and adding rose essential oil to it. That’s how exactly it looks. One look at it and you know its pure, handmade and chemical free. The fragrance is totally natural and smells like a fresh bunch of roses. I hate face washes which have artificial rose fragrances. The scent of Aroma Essentials Rose Face Wash is sure to relax and calm your senses. I take about a coin sized amount of the face wash and massage my face with it. Since its soap-free, it doesn’t foam at all. But still it cleanses the face deeply giving clean and fresh skin. There is no dryness and skin feels hydrated. There is also a subtle glow and brightness to the face. The face wash feels very cooling and soothes sun-burnt or acne-prone skin well. In the evening when I have more time, I like to apply the face wash and keep it on for 5 minutes. And believe me, the results are amazing. I would advise you to try this method and let your skin soak in the goodness of roses for atleast 5 minutes. Since rose has toning properties, it tones and firms my skin. My skin feels well hydrated and supple. It also soothes sunburns and reduces breakouts. Using it regularly everyday, I have noticed it brightens my skin and gives a soft pinkish tinge. I love to make rose face masks at home. But it takes a lot of time to crush and blend the rose petals. Having a handmade rose face wash makes it easy and we can use it everyday for more benefits. And its affordable as well. * 100% natural and handmade in small batches. * Cleanses skin deeply without drying it. * Wonderful calming fragrance like a fresh bunch of roses. * Gives a cooling sensation. * Hydrates skin and makes skin soft, smooth and supple. * Tones and firms skin. * Reduces and calms breakouts. * Brightens skin and gives a soft pinkish tinge. Yes, definitely, for all skin types. Very much affordable considering its a 100% natural and handmade product. Rarely do I ever purchase the same face wash twice. Unless the face wash is exceptionally good. And Aroma Essentials Rose Face Wash definitely fits the category. I would highly recommend this face wash to everyone as its natural and handmade and super affordable. Also gives amazing results. My tip is to leave the face wash on your skin for atleast 5 minutes to get all the goodness. Do check out my review of other face washes here. Have you tried any Aroma Essentials products? Do share your experience with them. liked ur detailed write up. Wow! Sounds like a wonder product! I’m planning to place an order soon with this brand.